The 1st Bedford Scout Group has a rich history. It’s been around for over 80 years. While the Group’s tradition is a point of pride, its future hasn’t always been as certain. Less than a year ago, the Group’s Beaver Colony was made up of only four members. In recent months, however, the Colony has grown by 750% — it now has 34 youth! The town of Bedford has proven to be a great ally for the 1st Bedford Scout Group. When youth participate in activities, they always make sure to proudly wear their Scout uniform along with their necker to enhance Scouting’s visibility within the community. As part of the town of Bedford’s 75th anniversary, the Scout Group got involved in many committees to help increase its exposure—as well as Scouts Canada’s—in the community. This exposure introduced Scouting to more youth in the region! When the 1st Bedford Scout Group takes part in activities in its community, it takes advantage of this opportunity and distributes invitations to inspire potential members to join Scouting. These cards contain key information about the Sections and help to promote Scouting in the Bedford community. The Beaver Colony also hosts Bring-a-Friend events during the Scouting Year to showcase Scouting to new youth. Andrée Fabry-Blais, the 1st Bedford’s Group Commissioner, points to the implementation of the Canadian Path program last September as one of the reasons for the Group’s success. The Canadian Path gives the youth the opportunity to make their own decisions and to decide what their program will look like. Youth take on more leadership responsibilities and select the activities they want to do, and they’re pleased to lead their program. “The new program will help many youth; you can already see its benefits,” Andrée says. In September, some of the Beavers in the Colony were shy. They’ve since become more outgoing – for example, they’ve done presentations for other Beavers about the badges they would like to pursue! 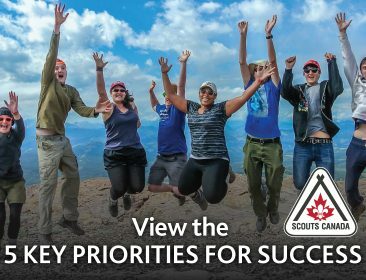 In addition to this perseverance, Andrée also mentions the financial assistance that Scouts Canada offers as part of its No One Left Behind program. The Group’s Sections make a point of mentioning it to parents. “So many youth want to join Scouting. We need to go get them,” Andrée says. 1st Bedford’s Beaver Colony is off to a great start. Andrée will now turn her attention to the other Sections to help them increase their numbers! To read other Group Growth articles, visit the ScoutScene Archives.